Hadronox is a legendary Druid class card from Knights of the Frozen Throne expansion. It is a nine-mana 3/7 Beast minion with a Deathrattle that summons your Taunt minions that died during the game. In other words, it is a slower N’Zoth the Corruptor for Taunt minions. Is that even good? Hadronox summons minions that have Taunt naturally. If you give a minion Taunt with a Sunfury Protector, for example, it will not be summoned. Druid class minions are a bit of a pain, because you need to know which ones transform into actual Taunt minions, and which ones simply gain Taunt. Shellshifter and Druid of the Claw transform themselves. Therefore, their Taunt forms will be resummoned by Hadronox. Ancient of War gains Taunt from its Choose One effect. Therefore, it will not be resummoned by Hadronox. Likewise, Nesting Roc gains Taunt from its Battlecry. It will not be resummoned by Hadronox. 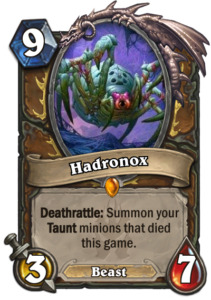 Hadronox itself has Deathrattle, so it can be resummoned by N’Zoth the Corruptor. N’Zoth will resummon Hadronox even if the original one is silenced to prevent its Deathrattle from triggering. Yeah, this is getting quite dizzying. Hadronox is a Beast, so you can summon another copy of Hadronox with Menagerie Warden. You can also draw Hadronox with The Curator. Spiritsinger Umbra can trigger Hadronox’s Deathrattle when it is played. To do this in a single turn, you would need 13 mana, so a single Innervate is not enough, you’d also need a Coin or another Innervate. There are also more random ways to get Hadronox on the board early: Barnes can pull a 1/1 copy and Bright-Eyed Scout and draw it as a five-cost minion. Y’Shaarj can also pull it from the deck. The big question is how do you live long enough to use Hadronox? Well, you probably want to run a number of Taunt minions with Hadronox, so those help. However, the turn when you actually play Hadronox, you are using nine mana to play a 3/7 minion. Not only that, but you also need that minion to die in order to gain the benefits, and that 3/7 statline can make killing it off rather difficult. How do you kill your own Hadronox? Naturalize works, you can even use it on the turn you play Hadronox. You can also Wrath or Starfall your own Hadronox to deal a little more damage to it after attacking into a minion. Unfortunately, you cannot Swipe or Book Wyrm your own minion. Getting Hadronox to die on the turn it is played or even the following turn can be difficult. Ramp Druid can be a powerful archetype. Big Druid is a competitive deck, and it relies on ramping up and playing big minions. Currently, it uses Y’Shaarj and Barnes to win some games outright, and it does not have enough room even for N’Zoth: Druid has weak board control tools and has to get the big guns out as fast as possible so that minions can be used to control the game. It can be a little difficult to see how Hadronox fits into this puzzle: it is so slow that without good board control tools, it can be too difficult to use to its full effect. Nonetheless, it offers Ramp Druid yet another option, and there are now many ways to build one: Big Druid, N’Zoth, Dragons, Beasts, Taunts, Quest… Hadronox can fit into many of these or some kind of hybrid build. However, compared to the simplicity and power of Big Druid running Y’Shaarj, all the other options might be a little too slow.